We get a lot of snow! I live in northern Ontario Canada where Lake Superior, the largest of the five Great Lakes, empties into Lake Huron. Lake Superior has over 80,000 sq. miles of water surface and is up to 2,000 ft. deep in places. It's always very cold water, rarely freezes totally over and has a great impact on our weather. The cold north winds kicks up tremendous storms and in the winter they contribute to "lake effect snowfalls" where we get , what we call, a good dumping. One year it snowed for 3 days straight dropping almost 5 feet of snow on our city. As a Canadian you tend to get use to Winter but I also hate the bitter cold so a lot of my winter painting is studio work. 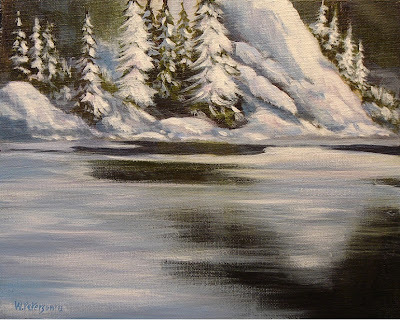 I do like painting winter scenes though and want to share two recent works with you. The first one is called "Just a Dusting". It's a bit of a tongue-in-cheek saying up here when one of those good snowfalls happen and we just laugh it off as a "dusting". Mother Nature has a way of bringing out the humour in us! Here the storm has just passed, the sky is clearing and the new snow sparkles in the cold air. 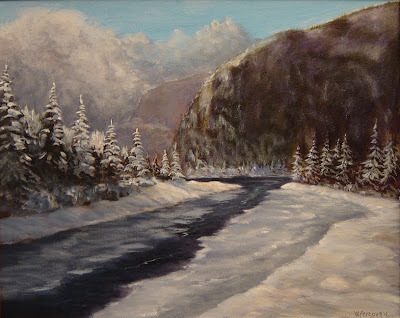 "Just a Dusting" by Warren Peterson 16" x 20"
This second one is called " A Quiet Day". The time just after a snowfall it can be very quiet. No wind, the sun peaking out and maybe a Chickadee or Blue Jay calling out as they hunt for food. This painting is a more intimate scene with a large rock face looming up in the background, over looking the lake that is just beginning to freeze over and has a light coating of snow in places. Such scenes are common here, offering you that feeling of wonder and awe that goes with nature's beauty! "A Quiet Day" by Warren Peterson 8" x 10"
More of these will be coming so so stay in touch by subscribing to my blog. Warren. You're paintings are very accomplished. Very pretty.